The name might be a mouthful, but Nga Kaiwhakairo-A-Opua Trust's philosophy and vision is simple: give the kids something to do. In 1995 after becoming unemployed, coordinator Rob Reed needed something to do, so he started carving in his garage. A couple of primary school children who wandered past decided to investigate. They joined in, spread the word, and now Rob has an average of 20 children per week attending his loosely structured carving workshops. And they’re still held in his garage. 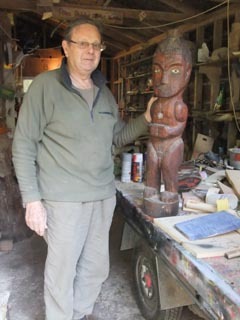 Northland’s population has a high proportion of Maori, and although not Maori himself, Rob uses his knowledge and research of Maori culture, customs and mythology to inspire the children’s designs and carvings. The main activities at Nga Kaiwhakairo-A-Opua are bone and wood carving, and sometimes this leads to sales of work and participation in craft shows. Rob likes to support the children’s interests. They come up with ideas for what they want to achieve, and he provides the space, time, resources and skills to enable it to happen. “When we were first going, one of the kids said, ‘We’d like new skateboards, all our skateboards are old and our parents won’t buy us new ones, can we make them?’ So that’s what we did. They painted them up and everything. My garage wall had some tagging on it. So they painted a mural on it. It looks much better. Rob organises trips to the Mokoia Taiaha Wananga and makes nominations for Community Achievement Awards. Many New Zealand Herald Young Kauri Awards have been achieved. He also encourages the children to get involved with community events. Original generation time 1.4572 seconds. Cache Loaded in: 0.0004 seconds.